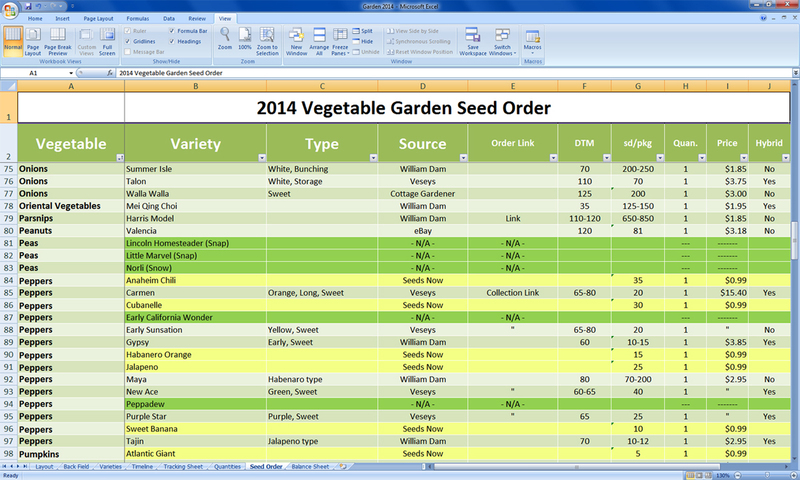 Three days into 2014 and the first seed order has been made. 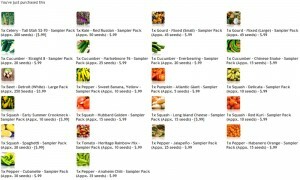 I ordered 22 seed packets for under $25.00 from SeedsNow.com on Saturday night after winning a gift certificate on Facebook on Saturday night. I usually order my seeds exclusively from Canadian seed companies when possible – which I like to try to do as much as possible with all my shopping – but this is, I think, an acceptable exception. 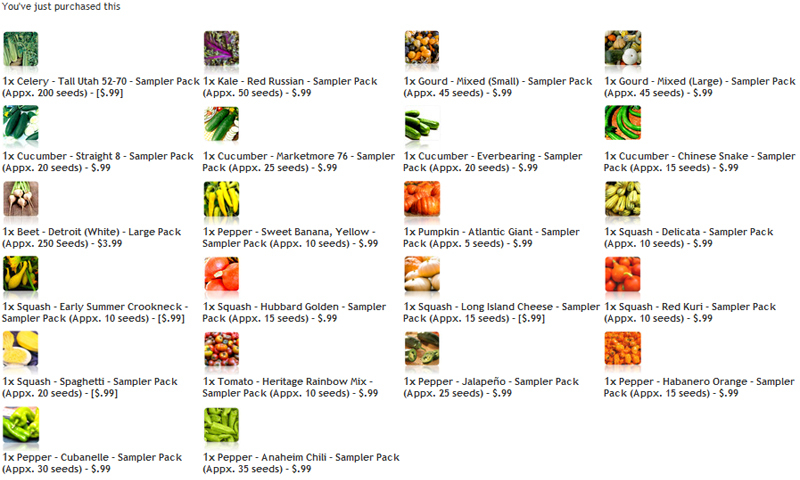 Most of the seed packets I chose were $0.99 sampler packs, but considering the large variety of vegetables that I plant I don’t need too many of each type. When you’re planting 8 different varieties of cucumbers 25 seeds of each variety is plenty. This gift card also allowed me to cross off some of the varieties that I want to try for the first time, as well. I had a list of squash that I want to try and I was able to pick up seven varieties in this order, as well as four types of cucumbers and a bunch of peppers. I tossed in a couple of packages of gourds, because last fall the pattypan squash that outgrew their usefulness and got donated as decorations for the local Harvest Festival got raves reviews, and I plan on blowing their socks off this year. Clicking that “add to cart” button on SeedsNow.com was very satisfying, and got me into the garden groove, right up until I hit the checkout button and saw the shipping cost for my order staring back at me. That’s when the downside of online seed buying came rushing back. Last year I planned my seed order so terribly that I think fully a quarter of my seed costs went to shipping. It makes me teary eyed just thinking about it. All in all the order from SeedsNow.com was still a very, very good deal. And I thank MIgardener (YouTube and Facebook) for his contest and the gift card. After I was finished with my order, and with the cost of shipping fresh in my mind, I loaded up my 2014 Vegetable Garden Seed Order list (as it’s called, quite officially), which includes all the varieties of all the vegetables that I want to grow in 2014, where I plan to order them from (or, if I already have the seed, its vital information), the cost, quantity of seed, etc, etc. Anything that’s relevant to making the final order. 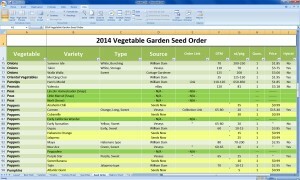 When I started my seed order list included nearly a dozen suppliers from whom I planned to order. With a little bit of work, and only one sacrifice (an artisan mix of tomatoes I’d planned to buy from Johnny’s), I reworked my list to include orders from only five suppliers (and a single planned purchase from eBay), and nearly all Canadian suppliers with the exception of SeedsNow.com and TomatoFest. I’m not sure how much that will actually end up saving me in the end, but it will undoubtedly end up saving money. And that’s never a bad idea. All in all my seed order list includes 112 varieties (not counting the 47 varieties for which I have seed from last year) of 35 different vegetables (and botanical fruits) to plant for 2014. Of the 159 varieties I plan to grow the largest single block will be tomatoes – of course – at 29 varieties. This year my seeds will be coming from Veseys, William Dam, Seeds Now, TomatoFest and the Cottage Gardener. This is all assuming I can keep my fingers out of other seed catalogues and websites; which is basically a lost cause before I even start.